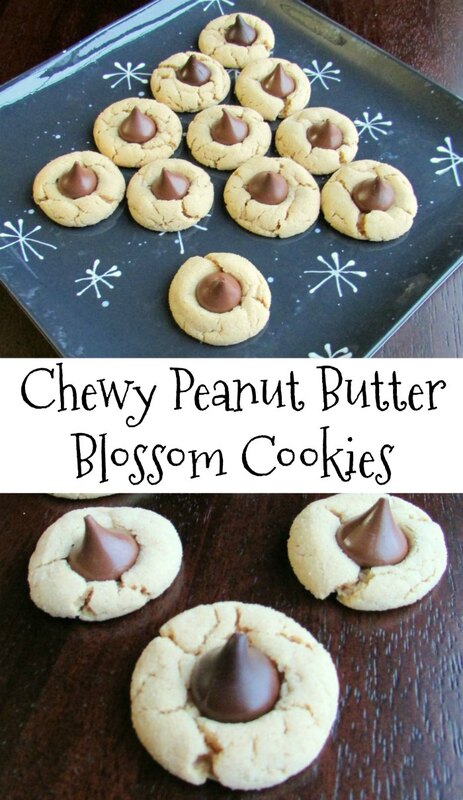 A chewier version of the classic blossom cookie. 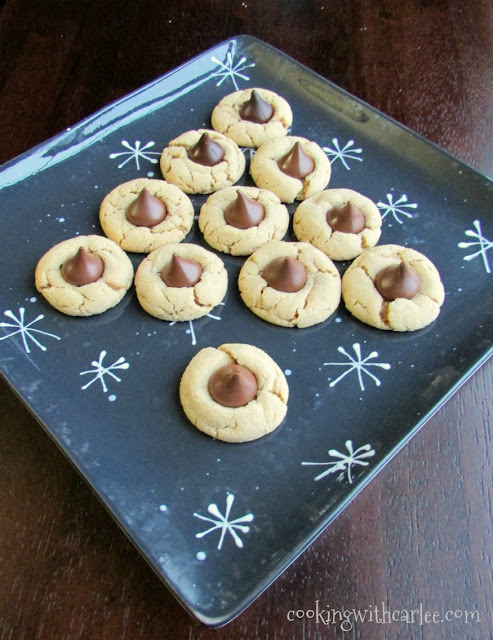 A soft peanut butter cookie hugs a chocolate candy for a piece of holiday heaven! It just wouldn't be Christmas without them! I know, I know. The 12 Days of Cookies is over. It sure was fun though, wasn't it? And I just couldn't help myself.... I've got cookie fever. So, I thought I should go for the baker's dozen. You see, yesterday was our friend Sam's birthday. I had to make him a batch of kolacky, they are his annual birthday request. While the oven was on and the flour and sugar were in the air, it seemed like we might as well make his other most requested cookie too. I mean, 'tis the season! I searched through my peanut butter blossom recipes, but none of them quite did it for me. You see, blossoms are usually a bit on the crisp side but I am on a chewy cookie bender and I needed more chew to my cookie. So I tinkered a bit and came up with a cookie with plenty of chew and a nice smooth peanut butter flavor. 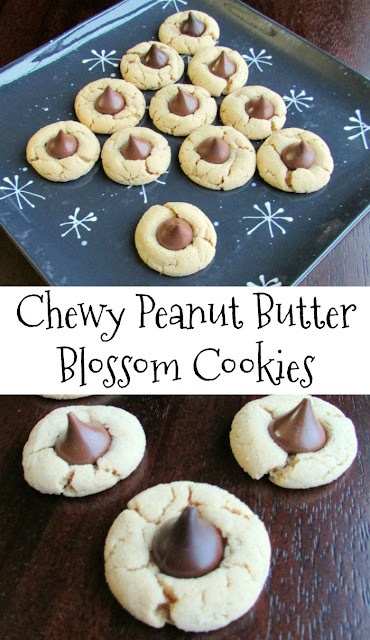 They are a bit flatter than your general blossom because of the texture change, but they have a nice smooth peanut butter flavor and are sturdy enough to stand up to the kisses. If you'd like plain peanut butter cookies, may I recommend my Great-Grandma's Peanut Butter Cookies? They have been in the family for ages and are always a hit. But we love having the added chocolate at Christmas time. They are always one of the first to go on the cookie trays. So go ahead and grab one. Actually, you better go ahead and grab a few. They're good. It's Christmas. You might as well enjoy yourself! Add sugar and brown sugar, beating until fluffy. Mix in eggs and vanilla. Stir together flour, baking soda and salt. Add dry ingredients to butter mixture. Roll about a Tablespoon full into a ball, then roll dough ball in extra sugar. Place on a baking sheet. Continue rolling and place cookies at least 2 inches apart. Bake for 7-9 minutes. Cookies should be puffy and soft looking. 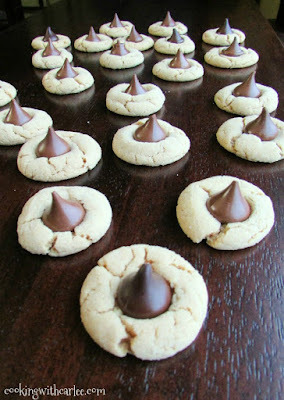 Allow to cool for a minute or two, then press a kiss into the center of the cookie. Remove cookies to wire rack and cool completely. I just made four dozen of these on Sunday! Plus an extra four dozen balls are in the fridge. They are perfect for pulling out and thawing and bake up just as nice over the next couple weeks. These are my nieces favorite so I always give her a whole dozen for herself! Such sweet little cookies! Have a beautiful day friend! What a great idea to freeze half of them!! Thanks, Andrea! I love to have all the traditional cookies, but I just can't keep from tinkering a bit! Hey Carlee! This post is a feature for my Funtastic Friday Link Party! Thank you for linking up! What's your Instagram handle?? Thank you, Lacie! My instagram handle is carleecooks... see you on insta! Yum! I love those! Thanks for sharing with us at Funtastic Friday Blog Hop! Thanks, Debra and merry Christmas! These cookies look so good. I just love peanut butter cookies. Thanks for joining the Family Joy Link Party!